Life has been so busy, and so exciting, but I am neglecting my corner of cyber space here. So what do I bring you, dear readers, as a gift from being gone for so long? How about some good old fashion girl power? It sounds cheesy, but I have been seeing loads of “empowering” campaigns for women and have been inspired by Jennifer Garner and her “baby bump admission” and pizza-eating acceptance speeches. If you have time, you should give both articles a read if you haven’t already. In the first article, J. Gar defends the pregnancy rumors explaining that after having kids, her “baby bump” is there to stay. The second article is FANTASTIC! While accepting an award at Elle’s Women in Hollywood Celebration, she points out how insane it is to have a night to honor “51% of the population”, and noted how differently she and her husband are questioned during press junkets. “Isn’t it kind of time to change that conversation?” she said during her speech. I couldn’t agree more! Having a slew of single male friends (and female friends, but this weighs heavier toward the male side) I am so sick of hearing about “she’s not that hot” or “she had a decent stomach” or “I’m sure she’s nice, but…” Don’t get me wrong, I am all for taking care of yourself, but we need to stop equating a person’s value with the shape of their body, and I am speaking mostly toward the beauty industry and how women are portrayed. “Enough of the impossible standards. Enough of the “ideal” image. Most of all, enough of the feeling of NOT ENOUGH when it comes to your own beauty. There also comes a time when an entire culture of women have had it. When blogs and ad campaigns and AS-IS selfie pictures start to change the rules of the game. Some times, men don’t seem to understand, and say that we put this pressure on ourselves as women. It is up to us to feel good about ourselves, with that I don’t disagree, but I think there should be a supportive culture behind us letting us know that it is ok to be all different shapes and sizes. Being healthy is beautiful, being strong is beautiful, being smart is beautiful, and being confident is beautiful. None of these come with sizes or measurements. Can’t that simply be our message? 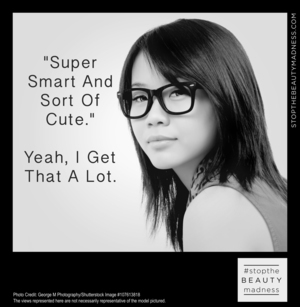 Do you have a favorite message or campaign about beauty? March on, fabulous readers, with confidence in who you are and in your individual beauty!